BentoLunch.net - What's for lunch at our house: Happy Thanksgiving! To my American readers, Happy Thanksgiving. May your day be filled with plenty of turkey and stuffing and gravy and yams. To my non-American readers, Happy Thursday, because Thursdays still rock since they are closer to the weekend. While next week will be full of leftover turkey day lunches, this one is a different kind of leftover lunch. Faith took this lunch the other day. 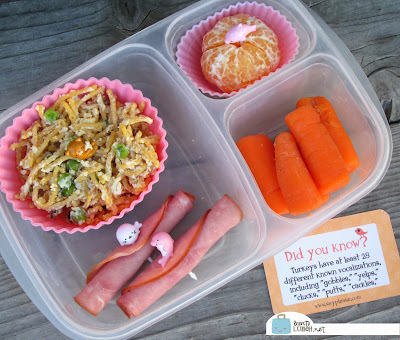 It holds yummy leftover carbonara, which is great warn or cold. Since it's low on protein, even with the bacon, she took a couple of ham rolls to make up for it. To the right, she has a mini orange and some carrots, along with yogurt, applesauce and a cheese stick for snacks (all not pictured). Lunch is packed in our Easy Lunchboxes and includes a Lunchbox Love Thanksgiving note. As part of the Lunchbox Love Mom Panel, I've been lucky enough to receive packs of notes for all occasions. We've especially enjoyed our holiday notes, especially the facts that each one features. 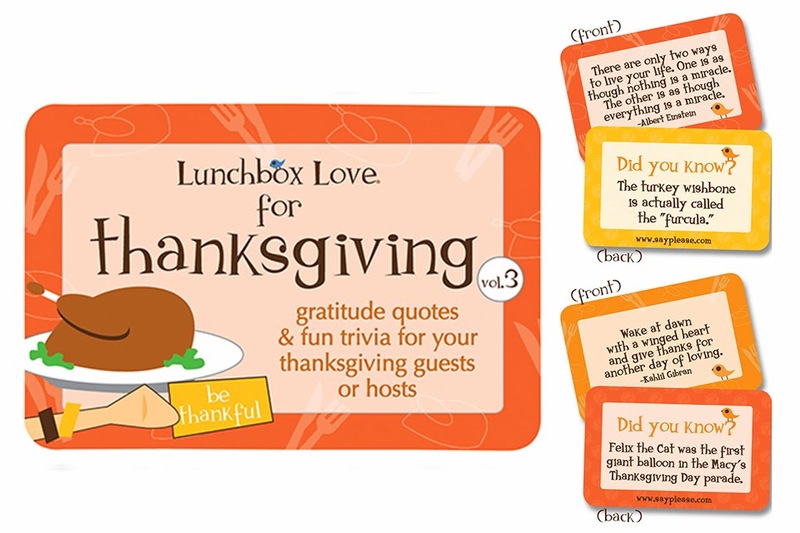 Our Thanksgiving pack was filled with amazing facts (check out the turkey fact with Faith's lunch above). While our dinner this year is just the three of us, I'm saving some of my favorite notes to use as place cards next year. The facts and quotes are perfect to share, and even with only 3, they've led to some amazing discussions. I can just imagine how well it would work with a larger table. Enjoy your day, be thankful for your family and friends, and thank you for being a little part of our world too.